For the newer 2018 edition of this white paper, click here. The majority of law firms have invested in CRM, but struggle to employ it effectively for business development purposes. 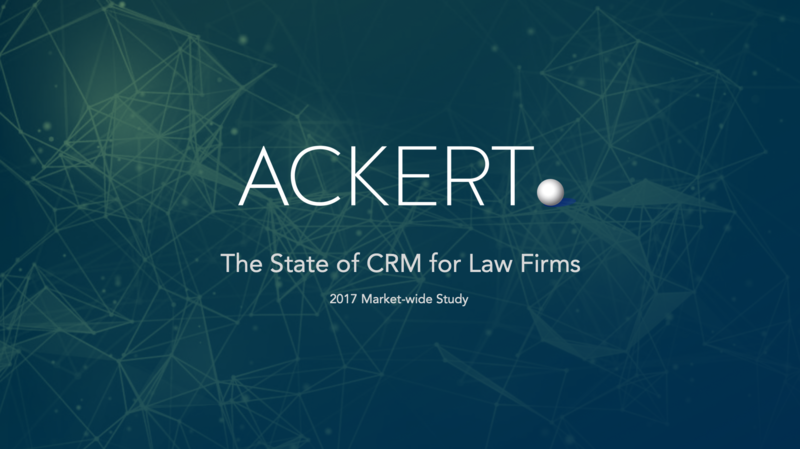 In Fall 2016, The Ackert Advisory conducted a market-wide study on the utilization and ROI of CRM for law firms. The survey of 130 North American legal marketers examined the cultural challenges behind lawyer CRM use, measuring ROI, and the interplay between CRM and lawyer business development. Whether your firm already has CRM or is looking to invest in a platform, these best practices will help you make the most of your marketing resources and improve adoption and ROI. Nearly three quarters of law firms have a CRM platform. Those who do not tend to be small firms. The market leader is InterAction, in use at 45% of responding firms, followed by ContactEase, which is in use at 24% of firms. Among survey respondents, ContactEase’s market share showed a significant increase, while InterAction’s decreased. 93% of survey respondents estimated that fewer than 31% of the lawyers at their firms actively use CRM, and 58% of respondents estimated that only 0-5% of lawyers at their firms engage in active use. The two primary reasons for CRM underutilization are lack of accountability for use by lawyers and a general lack of technological proficiency. It is noteworthy that these factors are cultural/behavioral issues rather than problems with the CRM software. ContactEase users are more likely to report higher utilization than the overall market, and InterAction users are more likely to report lower-than-average utilization. InterAction users are more likely than ContactEase users to report high levels of data entry and complicated interfaces. The vast majority of law firms reported that they had insufficient quantifiable data to calculate an ROI from CRM. Read the full report for more insights and explanations into our findings. We have also included a series of best practices at the end of this white paper. The data in the following analysis were compiled via a survey sent out to over 3,000 legal marketing and business development professionals worldwide. 142 respondents representing over 100 individual law firms provided answers to 9 questions concerning CRM utilization and ROI. The first survey question asked respondents whether their firm currently uses or has used some type of CRM system in the past. The results are displayed in Figure I. While the prevalence of CRM use in law firms has increased by 3% since last year, over a quarter of the legal market remain without a CRM platform. A further look at the data reveal that, controlling for firm size, the vast majority of firms without CRM are on the smaller side. 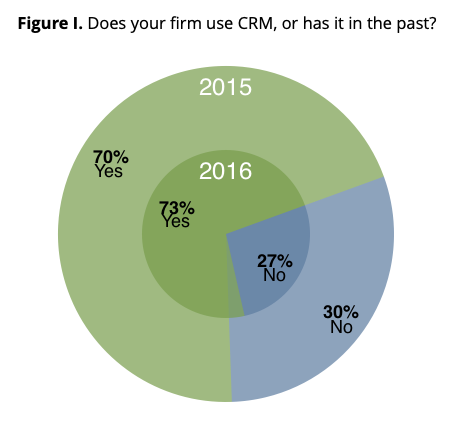 95% of firms with 201 or more lawyers indicated that they utilize or have utilized CRM. Unlike most other companies, law firms favor niched, industry-specific CRM platforms like InterAction and ContactEase over more robust and industry-agnostic platforms like SalesForce and Microsoft Dynamics. In terms of the market share each CRM captures, this year’s data is similar to last year’s, as illustrated in Figure II. 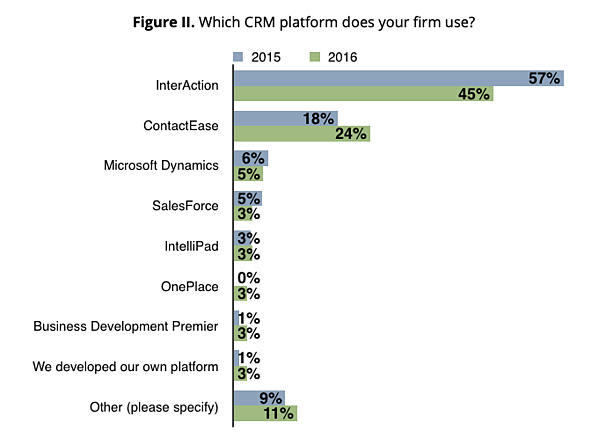 Given that law firms may utilize more than one platform, respondents were asked to list all CRM platforms in current use. Thus, the above figures specifically indicate prevalence of a particular platform within law firms, regardless of whether it is the sole CRM platform at a specific firm. InterAction is still the most popular platform in the market with 45% of CRM-using firms indicating usage, but its market share has decreased 12% since last year. In second place is ContactEase with 24% market share, a 6% increase from last year. Together the two platforms are used in 69% of responding law firms. The category of “Other” consists of various CRM platforms that, on their own, did not receive at least 1% market share. These included HubSpot, Soffront, Insightly, Contact Manager, ContactNet, and Constant Contact. 73% of law firms possess a CRM platform, but this level of market penetration does not necessarily correlate to actual CRM utilization by lawyers. 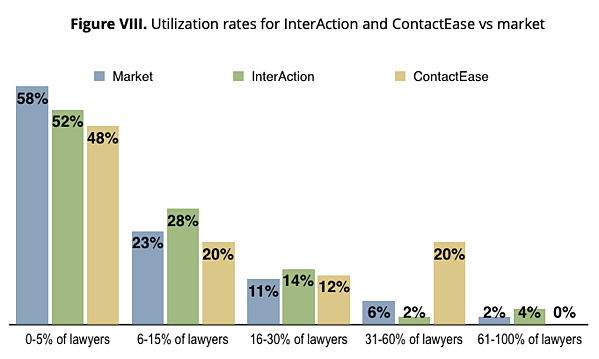 As Figure III below shows, very few law firms have high rates of lawyers utilizing CRM actively. A total 93% of survey respondents estimated that fewer than 31% of the lawyers at their firms actively use CRM, and 58% of respondents estimated that only 0-5% of lawyers at their firms engage in active use. The weighted average for 2016 utilization rates was a range of 5.8%-14.6% of lawyers using CRM regularly. Overall CRM utilization by lawyers decreased significantly from 2015 to 2016. The number of respondents who estimated that 0-5% of their firm’s lawyers use CRM increased by 12%. And the prevalence of firms that indicated <31% utilization increased by 8% this year. Because the survey did not poll lawyers individually, the data in Figure III do not necessarily indicate the usage rates of the entire attorney population. Instead, they reflect the estimates of the marketing and business development staff charged with overseeing the implementation of CRM at their respective firms. 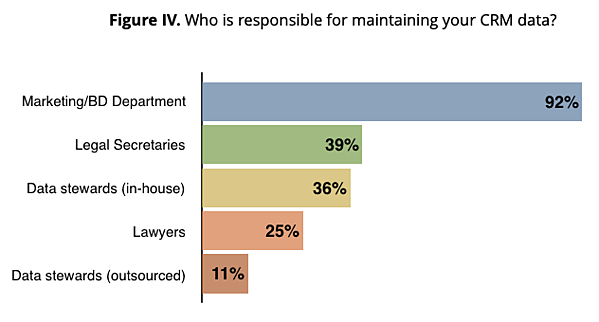 The fourth survey question explored who in the firm, if not lawyers, utilizes and maintains CRM databases. Note that the percentages below add up to more than 100 because respondents were able to select more than one answer. 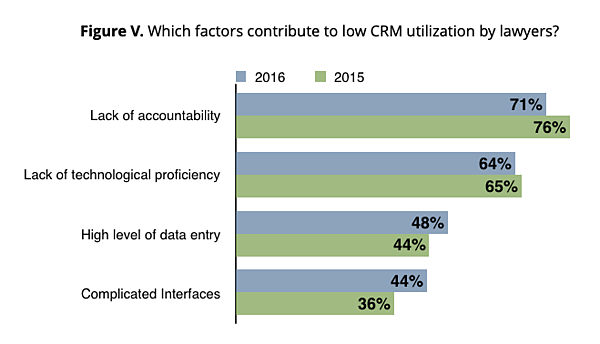 As Figure IV shows, law firms rely heavily on marketing and business development professionals to maintain CRM data. Given that lawyer utilization levels have decreased since last year, one possible explanation is that law firms have been hiring an increasing number of junior-to-mid-level marketing and business development staff, who are likely to take over the responsibility of maintaining CRM databases. This makes sense from a cost perspective; firms tend to emphasize that lawyers’ valuable time be spent on billable hours rather than administrative tasks. However, the increasing need for lawyers to engage in business development in order to stay competitive is at odds with the need to focus on billing hours. CRM, or at least some kind of pipeline management system, is a necessary component to tracking business development activities for lawyers and marketers alike. Given this increasing need for lawyers to engage in business development, and for their utilization of technology to follow suit, the next survey question explored the limiting factors behind low CRM utilization by lawyers. Respondents were asked to choose from a list of reasons contributing to low CRM usage rates by lawyers. Multiple reasons could be selected and a write-in box was provided for participants to list reasons not explicitly stated. The results are shown in Figure V below. Because respondents were able to select multiple reasons, the percentages added together amount to greater than 100. Figure V is best analyzed by differentiating between technological attributes of CRM platforms and firm-specific attributes. While complicated interfaces and high levels of data entry are CRM-specific qualities, CRM providers are unable to influence the technological proficiency of lawyers or the lack of accountability at law firms. Cultural factors at the firm have a larger influence on CRM utilization than platform design. In 2016, 71% of marketing and business development professionals attributed low CRM use by lawyers to a lack of accountability. In a close second, survey takers also listed general lack of technological proficiency as a contributing factor. Of some note is the observation that these limiting factors have decreased marginally since last year, suggesting that firm culture around CRM use is shifting. With regard to CRM design, nearly half of respondents faulted their specific platform for high levels of data entry, and 44% indicated that their platform’s user interface was too complicated. A lack of accountability for lawyers to engage in proactive behaviors is a prevalent theme, as we uncovered in another market-wide study on business development challenges at law firms. The #1 problem inhibiting the success of business development initiatives was a lack of accountability for lawyers to engage in follow-up activities with their key relationships. The accountability problem extends to CRM utilization as well. CRM is more likely to be used for marketing functions (e.g., mailings and client data) than business development functions like pipeline management and follow-up reminders. As such, marketers will find greater CRM utility than lawyers will, especially at firms that have been slow to adopt an emphasis on business development. This is the likely cause for the results shown in Figure VI. Over half of responding law firms indicated that little to no emphasis is placed on CRM use by lawyers. Some of these firms do not provide attorneys with access to CRM at all, as shown in the write-in responses under Figure V. However, this leaves a remaining 45% of firms who do expect at least some level of CRM utilization by lawyers. As Figure VII shows, these firms might benefit from increasing the level of accountability to which their lawyers are held with regard to CRM use. 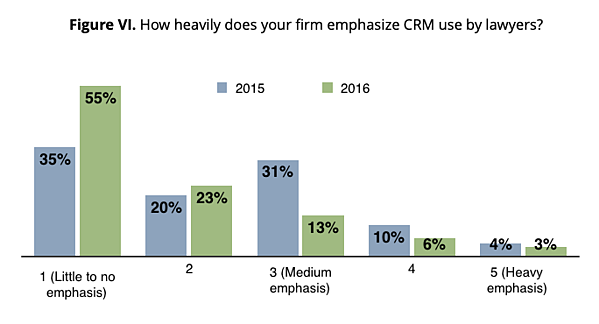 The level of emphasis placed on CRM use by lawyers has decreased markedly since last year. In 2015 the weighted average of the above rating scale was 2.3 (less than medium emphasis) and in 2016 the weighted average was 1.8. Perhaps the cultural challenges listed in Figure V above have led law firms to abandon attempts to increase lawyer utilization in favor of allowing marketing and business development staff to manage CRM systems. 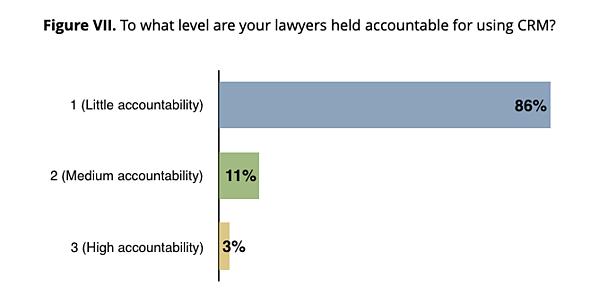 Unsurprisingly, a majority of firms report that lawyers face little accountability for using CRM. Those firms that do implement accountability structures are likely the same firms that take a more progressive approach to business development and encourage lawyers to use CRM for pipeline management. Given that InterAction and ContactEase possess a 69% market share, it is useful to break down usage rates for these platforms specifically. This drill down into the data provides a useful comparison of the legal industry’s most popular CRM platforms versus the market as a whole. Turning our attention back to usage rates, Figure VIII is a comparison between the usage rates of InterAction, ContactEase, and the market as a whole. This provides a comparison of 2016 data without reference to our 2015 study. Figure VIII shows us that InterAction users are more likely to under-utilize CRM than ContactEase users. Taking a weighted average of the median percentage values for each bracket, the market as a whole has a 11% usage rate, InterAction has a 12% usage rate, and ContactEase has an 18% usage rate. In other words, firms using ContactEase reported that an average of 18% of lawyers use CRM regularly, while firms using InterAction see an average of 12% of lawyers using the software regularly. To explore why these differences in utilization rates exist between platforms, we compared the reasons behind low utilization between InterAction, ContactEase, and the market as a whole. This comparison is shown in Figure IX. For the sake of analysis, we will only focus on the CRM-specific attributes for low usage. Again, lack of accountability and lack of technological proficiency are firm-specific and are not influenced by the specific CRM platform. 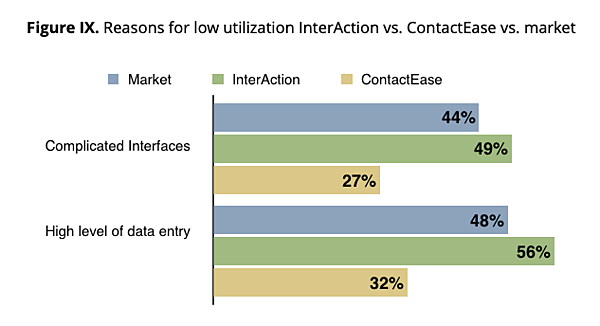 That being said, firms using InterAction are 22% more likely to indicate complicated interfaces as a reason behind low CRM utilization when compared to those respondents with ContactEase. InterAction users are also 24% more likely to report a high level of data entry as inhibitive of utilization than ContactEase users are. Another noteworthy observation is that firms using InterAction reported greater instances of these technical shortcomings than the market as a whole did, and ContactEase users were less likely than the average respondent to indicate these problems. Figure IX should not be interpreted to mean that marketing and business development professionals believe that InterAction’s interface is more complicated than ContactEase’s in direct comparison. To gather information such as this, respondents who have used both would need to be asked which one is more complicated. Rather, the data in Figure IX measure survey takers’ impression of their own CRM platform, and it happens to be the case that those using InterAction, on average, are more likely to label its interface as complicated compared to those using ContactEase. Like any investment made in business development or marketing, CRM is only as good as the ultimate return that it garners for the firm. Implementing a CRM platform not only entails the costly licensure of the actual platform, but it also often requires training to use it correctly. When fully implemented, combined costs can swell to five figures or even six figures for larger firms. 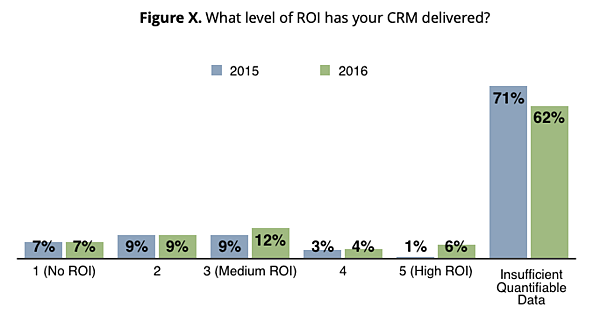 Despite the fact that 73% of firms have CRM, most firms are in a poor position to effectively measure its resultant ROI. One of the last questions in the survey asked participants to rank the level of quantifiable ROI their firm’s CRM has generated. An option was also provided for those firms without sufficient data to effectively assess ROI. Figure X below compares the responses to this question with those of our 2015 study. The majority of firms indicated that they lack sufficient quantifiable data to determine whether their investment in a CRM platform has led to a measurable return. Particular emphasis was put on quantifiable data due to the oftentimes subjective nature of measuring ROI for various initiatives (used by marketing and business development staff). It is the firm belief of this paper’s authors that soft, anecdotal assessment metrics are unable to compare with more objective data indicators such as originations, new matters opened, and total revenue figures. And given the significant investment needed to fully implement a CRM initiative, the lack of objective quantifiable data tracking is cause for concern. Encouragingly, firms have improved their ability to measure quantifiable ROI since last year. The instance of respondents who indicated they had insufficient quantifiable data to calculate ROI decreased by 9% this year, and firms that indicated a high ROI increased by 5%. Marketing and business development professionals should endeavor to find more ways to quantify this metric, especially if they wish to emphasize the value of CRM and encourage its utilization by lawyers. Download the full white paper to see the conclusion of our findings, as well as go-forward best practices.